The Colony of New Zealand was a British colony that existed in New Zealand from 1841 to 1907. Originally a Crown colony under a Governor appointed by the United Kingdom, the colony became self-governing from 1853. In 1907, the colony became the Dominion of New Zealand. Following the first signing of the Treaty of Waitangi on 6 February 1840, William Hobson made declarations of British sovereignty over the islands of New Zealand on 21 May 1840 in two separate formal declarations. In the first declaration, Hobson declared British sovereignty over the North Island. The basis for the claim over the North Island was the grant of sovereignty to the British supposedly agreed to by the Māori tribal leaders in the English version of the Treaty of Waitangi. In the second declaration, Hobson declared British sovereignty over the South Island and Stewart Island. The basis for the claims over these islands was that of "first discovery" by Captain James Cook. Initially, New Zealand was part of the Colony of New South Wales and Hobson the Lieutenant-Governor, answerable to his superior, the Governor of New South Wales. By letters patent, the British government issued the Charter for Erecting the Colony of New Zealand on 16 November 1840. The Charter stated that the Colony of New Zealand would be established as a Crown colony separate from New South Wales on 1 July 1841. With the establishment of the Crown colony, Hobson became Governor of New Zealand. The first organs of the New Zealand Government were also established. An Executive Council and Legislative Council were created to assist the Governor. The Legislative Council consisted of the Governor, Colonial Secretary and Colonial Treasurer (who consisted the Executive Council) and three justices of the peace appointed by the Governor. The Legislative Council had the power to issue Ordinances, statutory instruments. The colony was initially divided into three provinces, New Ulster Province (the North Island), New Munster Province (the South Island), and New Leinster Province (Stewart Island). As new European settlements were founded in the colony, demands for self-government grew. The New Zealand Company settlement of Port Nicholson (Wellington) had its own elected council, which was forcibly dissolved by Lieutenant-Governor William Hobson in 1840. Later, Wellington became the centre of agitation by settlers for representative government led by Samuel Revans, who founded the Wellington Settlers' Constitutional Association in 1848. The first Māori districts. As a result, almost all of the Act was suspended for six years pending a new Act of 1852, the only operative part of the 1846 Act being the creation of New Zealand's first provinces. In the meantime, Grey drafted his own Act which established both provincial and central representative assemblies, allowed for Māori districts and an elected Governor. Only the latter proposal was rejected by the Parliament of the United Kingdom when it adopted Grey's constitution. The second New Zealand Constitution Act was passed in 1852 and became the central constitutional document of the colony. It created the General Assembly, which consisted of the Legislative Council and an elected House of Representatives from 1853. The first general election for the House of Representatives was held between 14 July and 1 October of that year. The 1st New Zealand Parliament was opened on 24 May 1854. The Administrator of Government, Robert Wynyard, was quickly confronted by the demands of the new Parliament that responsible government be granted to the Colony immediately; on 2 June the House of Representatives passed a resolution, sponsored by Edward Gibbon Wakefield, to that effect. Wynyard refused, stating that the Colonial Office made no mention of responsible government in its dispatches. The appointed Executive Council advised Wynyard against implementing responsible government, and in the meantime he sent a dispatch to London requesting clarification. Wynyard then offered to add some elected members of parliament to the Executive Council, and appointed James FitzGerald, Henry Sewell and Frederick Weld to the council. The compromise worked for a few weeks but on 1 August Parliament demanded complete power to appoint ministers. Wynyard refused, and all three MPs resigned from the council. In response, Wynyard prorogued Parliament for two weeks. On 31 August he appointed Thomas Forsaith, Jerningham Wakefield and James Macandrew to the Executive Council, but when Parliament met again it moved a motion of no confidence in the members. Parliament met on 8 August 1855, by which time Wynyard had received instructions from the Colonial Office to introduce responsible government. Fortunately for Wynyard, the new Governor, Sir Thomas Gore Browne, arrived on 6 September 1855 and relieved Wynyard of his duties. On 28 January 1858, Wynyard was appointed to the Legislative Council. Governor Thomas Gore Browne subsequently announced that self-government would begin with the 2nd New Zealand Parliament, elected in 1855. Henry Sewell was asked by the Governor to form a government, now known as the Sewell Ministry. He became Colonial Secretary – effectively the first Premier of New Zealand – on 7 May. Sewell's government was short-lived, however. The leader of the provincialist (pro-provinces) faction, William Fox, defeated Sewell's government on 20 May 1856. Fox himself, however, did not retain office for long, being defeated by Edward Stafford, a moderate. The flag of New Zealand 1841 – 1902 was the Union Flag. 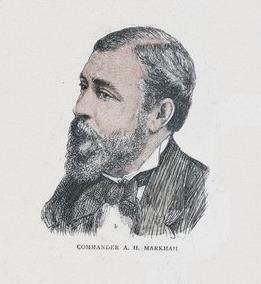 First Lieutenant Albert Hastings Markham, designer of the Flag of New Zealand. The first flag used by the Colony of New Zealand was the British Union Flag. This began to change with the Colonial Navy Defence Act 1865, which required all ships owned by colonial governments fly the defaced Royal Navy blue ensign with a Colonial badge. New Zealand did not have a Colonial badge, or indeed a Coat of Arms of its own at this stage, and so the letters "NZ" were simply added to the blue ensign. Peter Spiller et al. (2001, 2nd ed.) A New Zealand Legal History (Brookers: Wellington). ^ a b "Crown colony era – the Governor-General". 30 August 2012. Retrieved 13 October 2012. ^ "NO. 21. — CHARTER FOR ERECTING THE COLONY OF NEW ZEALAND, AND FOR CREATING AND ESTABLISHING A LEGISLATIVE COUNCIL AND AN EXECUTIVE COUNCIL, AND FOR GRANTING CERTAIN POWERS AND AUTHORITIES TO THE GOVERNOR FOR THE TIME BEING OF THE SAID COLONY". ^ "Te Ara – William Hobson". Retrieved 13 October 2012. ^ "Dictionary of New Zealand Biography – Samuel Revans". Retrieved 25 January 2010. ^ "Constitution Act 1852 – English Version". 30 June 1852. Retrieved 13 October 2012. ^ Rogers, Frank. "Wynyard, Robert Henry – Biography". ^ 1S8, Sewell, Henry – Biography. February 2012 "Colony of New Zealand". ^ McIntyre, W. David. "FitzGerald, James Edward 1818–1896". ^ Scholefield 1950, p. 31. ^ Volker Preuß. "Flagge Neuseeland" (in German). Retrieved 2003-09-07. ^ , Norfolk Museums and Archeology Service"Rear-Admiral Sir Albert Hastings Markham". Retrieved 2008-11-18. ^ "New Zealand Signalling Ensign" (in Italian). http://www.rbvex.it. Retrieved 2004-08-20. ^ "New Zealand Signalling Flag". NZ History.net.nz. Retrieved 2012-01-20. It read – "Edward R. & I. Whereas We have on the Petition of the Members of the Legislative Council and House of Representatives of Our Colony of New Zealand determined that the title of Dominion of New Zealand shall be substituted for that of the Colony of New Zealand as the designation of the said Colony, We have therefore by and with the advice of Our Privy Council thought fit to issue this Our Royal Proclamation and We do ordain, declare and command that on and after the twenty-sixth day of September, one thousand nine hundred and seven, the said Colony of New Zealand and the territory belonging thereto shall be called and known by the title of the Dominion of New Zealand. And We hereby give Our Commands to all Public Departments accordingly. Given at Our Court at Buckingham Palace, this ninth day of September, in the year of Our Lord one thousand nine hundred and seven, and in the seventh year of Our Reign. God save the King." A Royal Proclamation granting New Zealand Dominion status was issued on 26 September 1907. The Colony of New Zealand formally continued until 26 September 1907, when, by request of the New Zealand government, King Edward VII declared New Zealand to be a dominion. The 1907 change from colony to dominion was largely symbolic, and New Zealand did not become legally independent from the United Kingdom until the General Assembly of New Zealand enacted the Statute of Westminster Adoption Act 1947, which applied the Statute of Westminster 1931 to the Dominion of New Zealand (although the United Kingdom retained the right to legislate for New Zealand at its request); certain colonial enactments survived for sometime after — the New Zealand Constitution Act 1852 was finally replaced by the Constitution Act 1986. The flag of New Zealand, 1867–1869.